Everyone needs to get their fair share of vitamins and nutrients every day to ensure a healthy, fit, strong and supple body. But as we get older, good nutrition becomes even more important. That’s because, as we age, our bodies become less efficient at absorbing all those vital nutrients. In other words, we have to eat more of the good stuff to get the same result. These days, though we have to accept growing older, nobody wants to feel old. That’s why it’s essential to make sure you get a good range of vitamins and nutrients in your diet. Keeping at a healthy weight and taking part in regular exercise will also help to keep your body and mind feeling youthful for longer. As the years go by, which vitamins become even more important to our health and well being? As an anti-oxidant, vitamin C helps to mop up cell-damaging free radicals. In other words, vitamin C is believed to slow down premature ageing and help keep disease at bay. So, while everyone benefits from enough vitamin C, you might be particularly fond of it if you want to stay younger for longer. Vitamin C may also help the body to absorb iron. So to get the most iron out of your meal if you’re having an iron-rich product, such as a piece of steak, try drinking a glass of orange juice before your meal, or tucking into some tomatoes or peppers as a side dish. Citrus fruit, strawberries, blueberries, green vegetables, peppers, tomatoes and potatoes are all great sources of vitamin C – and they’re all delicious too. Not just for expectant mums, make sure you eat plenty of foods rich in folic acid if you want to help maintain good health as the years go by. As your body becomes less efficient in absorbing this essential B vitamin, try adding some green vegetables to your meal, and choosing brown rice instead of pasta or white rice now and again. Citrus fruits and kiwi fruit contain folic acid, and you’ll also find many breads and breakfast cereals have folic acid in them. 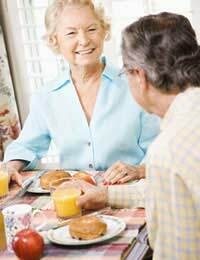 Calcium isn’t a vitamin, but it is an essential nutrient and one that’s particularly important to older people, so it’s probably worth a mention anyway. Osteoporosis is a serious health issue for older people. Although women tend to suffer more than men, it is a disease that attacks both sexes and can result in disability and even death. Osteoporosis is a thinning of the bones. Taking plenty of weight-bearing exercise will help to counter the effects of osteoporosis, as will eating calcium rich foods, like milk, cheese and yoghurt. Choose lower-fat varieties if you can. But if you don’t like dairy products, don’t worry. There’s plenty of calcium to be found in tinned sardines, broccoli, cabbage, soya beans and tofu. Vitamin A:Though most of the time it’s essential to bump up your vitamin intake as you get older, having too much vitamin A in your diet might increase the risk of bone fracture. You shouldn’t be getting more than 1.5mg of vitamin A each day. To cut down on your risk of eating too much vitamin A, try to avoid eating liver or liver products like pâté more than once a week. If liver is your favourite and you really can’t give it up, try eating smaller portions. If you take vitamin supplements, look out for the amount of vitamin A they contain. Avoid taking fish liver oils too as these are usually high in vitamin A. Like calcium, vitamin D is an essential nutrient for good bone health, so it’s a key one for older people to look out for. Vitamin D is found in oily fish, eggs and certain fortified breads and cereals. But the human body gets most of its vitamin D from the effect of sunlight on our skin. As we get older, we often find we spend less time out and about, and mature people who spend most of the day indoors and those who are housebound – as well as women who’s culture requires them to stay fully covered when outside – may be lacking in vitamin D.